Planning a birthday celebration or wedding? Is your girlfriend getting hitched and you’re planning for a private ladies party? How about a gift to the bride to be? Let us entertain your guests when they arrive for your event. How about a gathering of ladies for private dance, learning and sharing session? 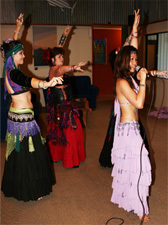 We conduct private dance session for ladies with a group minimum of 4. The session introduces posturing, awareness to rhythm, range of hip and pelvic exercises. As well as exotic and sensual moves to improve your repertoire of dance and bedroom moves! Thank you so much for Friday night! We had an amazing time, my cheeks hurt from smiling and laughing so much. There is nothing that we didn’t enjoy, the girls have not stopped raving about it since. We will definitely be recommending you to people. A special thank you to you and your team that performed at our Health Information Association of New Zealand Conference Dinner on the 24th November 2008 @ Waiau Estate Winery. The formal and informal feedback from the delegates was nothing short of brilliant and this is a credit to you all!